You may have noticed, looking over the breadth of PlayStation VR coverage that we have, that we don't have a review for one of the headset's launch titles, Driveclub VR. Well, there's a reason for that, and that reason starts with "motion," ends with "sickness," and in the middle there's a "BLLLFRRRPPHH!!!" Virtual reality is cool and all, but it's also a relatively new technology, and that means there are kinks yet to be ironed out. 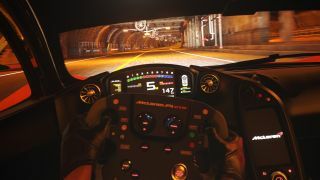 One of the biggest obstacles for VR is reducing or eliminating motion sickness - a feat that Driveclub VR, we're sad to say, does not at all accomplish. If things change and we find someone with an iron stomach and inner ears of steel, we'll let you know. In the meantime, consider this a cautionary tale, and keep a wastebasket nearby just in case. Seen something newsworthy? Tell us! About Us - Who's on the GamesRadar+ team? SteelSeries Arctis 9X review: "The new king of Xbox headsets has arrived"
Mortal Kombat 11 review: "Newcomers and fans alike will have a lot to love"
Heaven’s Vault review: "A stunning setting, but the story fails to find its voice"
My Time at Portia review: "Almost perfects the life-building simulator genre"
Honor View 20 phone review: "A superb gaming phone with a wealth of smart features"
Hellboy review: "The disjointed end product positively reeks of studio interference"
Dumbo review: "Struggles to maintain altitude"
Eighth Grade review: "Nothing short of profound"
Vox Lux review: "A lead from Natalie Portman that hurtles off the show-stealing scale"
Shazam! review: "One of the most irresistibly likeable superhero films in ages"
Game of Thrones season 8 episode 1 review: "A stunning reminder of what makes Game of Thrones special"
Chilling Adventures of Sabrina season 2 review: "Michelle Gomez as Lilith is the stand-out star of this series"
Star Trek Discovery S2.10 review: "We’ve come to expect better from Discovery"
Get the best gaming deals, reviews, product advice, competitions, unmissable gaming news and more! GamesRadar+ is part of Future plc, an international media group and leading digital publisher. Visit our corporate site.